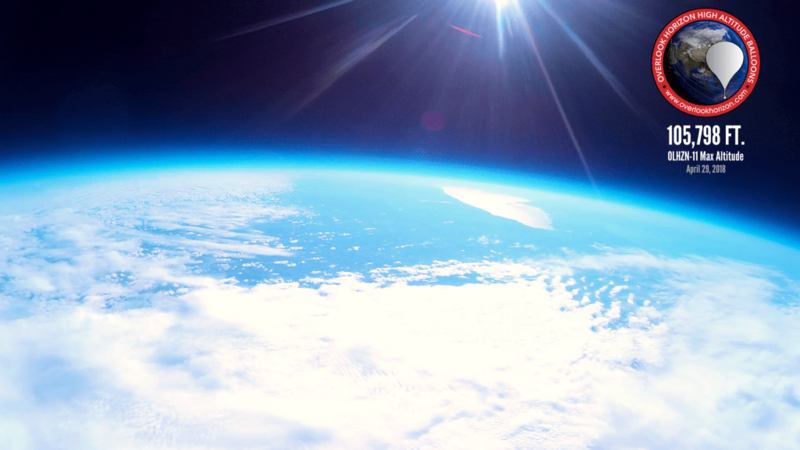 OLHZN-11 was the eleventh high altitude weather balloon flight for Overlook Horizon High Altitude Balloons. This flight occurred on April 29, 2018 at 3:01pm EDT (19:01 UTC). The focus of this flight was to test our updated large radio tracking systems to ensure that our repairs we made after last year’s flights are performing as expected. This flight also used two Lightdow LD4000 Cameras facing outwards on both sides of the payload. 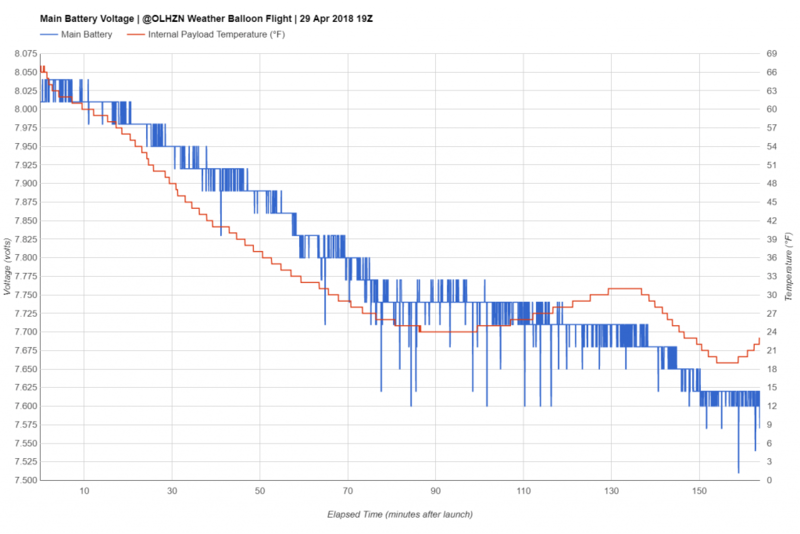 Additionally, this flight had our new micro-payload that was originally flown on OLHZN-10 which was used as a third backup tracking method on this flight to further test performance of the micro-payload. Capacitors added permanently to the circuit design. These were added in a temporary manner previously on OLHZN-8 and OLHZN-9. Software updated for optimizations in performance and reliability. This started out looking to be a terrible day for weather balloon flying, but turned out to be a great success! The morning started out cold, cloudy & windy with a mixture of rain & snow in the air. Fortunately, we found a new launch location that was well shielded from the higher surface winds which made inflating the balloon very tolerable. Balloon filling proceeded on schedule along with all our startup procedures. We experienced a slight delay around the T- 2 minutes time period as the local FAA TRACON center was unable to locate our flight information we had filed days earlier. We were able to quickly forward them a copy of the information, but ended up launching 98 seconds late, which is not bad, but unsatisfying since we aim to always launch at exactly T-0. The flight itself proceeded nearly perfectly. Our main onboard computer operated flawlessly throughout the entire flight and provided flawless positioning reports throughout the entire flight. Our secondary micro-payload that we introduced on OLHZN-10, however, experienced the exact same failure that was experienced on OLHZN-10. 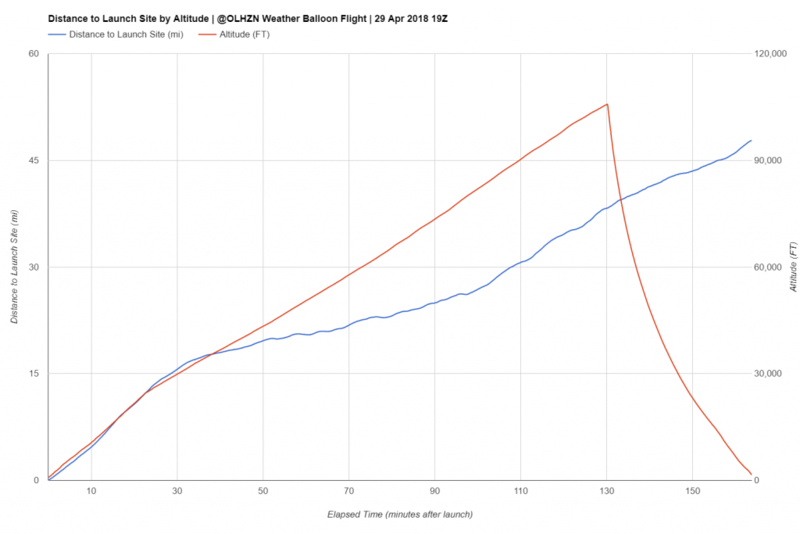 Fortunately, this was just a secondary system so it did not impact flight operations and in reality, this was actually exciting since we were able to finally verify the exact cause of the OLHZN-10 failure. 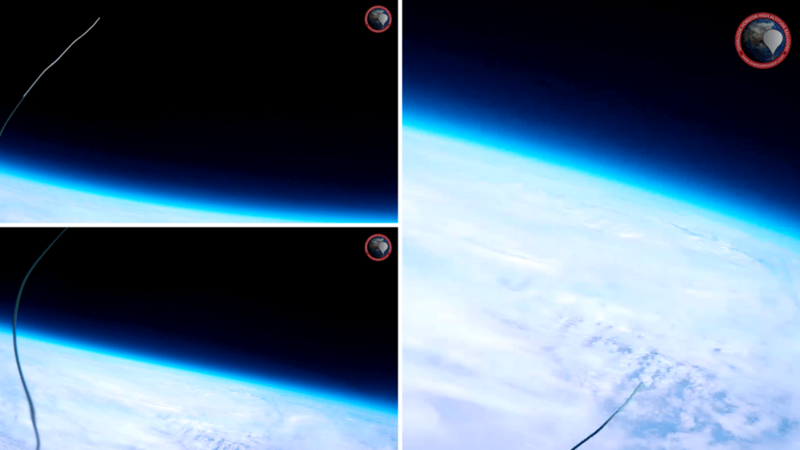 Shortly after the balloon burst event, we discovered (and captured on video) the radio antenna for the micro-payload detached from the payload due to the extremely cold temperatures and the extreme oscillations that are commonly experienced during the descent phase. This antenna was simply built from a piece of 22 AWG solid core wire which proved to be too rigid in the cold temperatures. 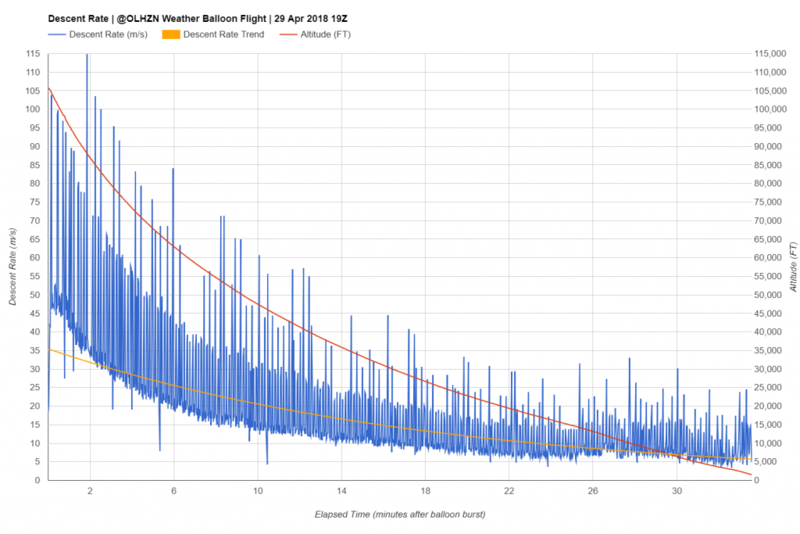 Our next flight for OLHZN-12, will make use of .33mm guitar wire instead which is more flexible and should hopefully provide better tolerance to the oscillations. The landing for this flight occurred in Moravia, NY which was 7.40 miles northeast of our predicted landing location which is well within our expected margin of error for our landing locations. We usually try to keep the uncertainty to within 10 miles, but anything under 15 miles is still acceptable. A prediction under 5 miles is fantastic! 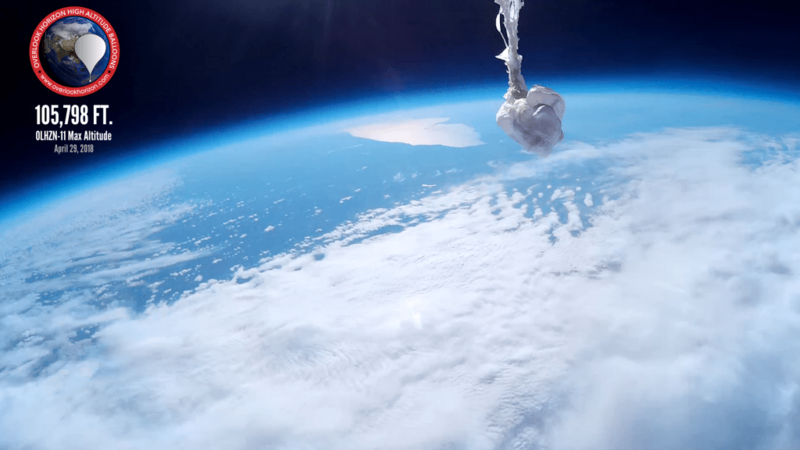 The payload concluded its flight at the top of a 75 ft. tall ash tree which the parachute snagged on “landing”. We made several attempts to launch a piece of string over the branch to try to bring down the payload, but were unsuccessful. The extremely generous landowner then offered to cutdown the offending tree (which he plans to use for firewood) with his chainsaw. He was very successful at that and as the tree came down, the payload train line snapped (expected) and the payload freefell the remaining 75 ft. and made a hard, but successful landing. All the equipment remained undamaged, including the external micro-payload that had a direct impact with the ground on landing. Overall this was a very successful flight and leaves us extremely positive for the rest of our upcoming 2018 flights! 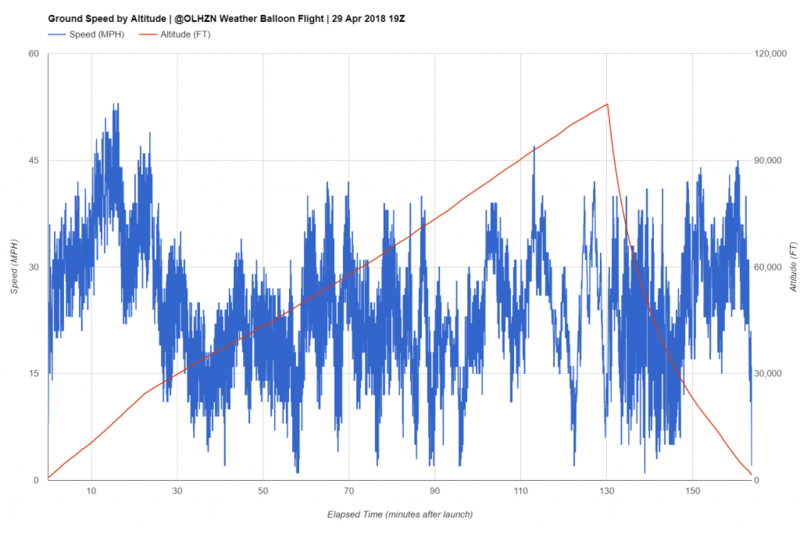 This flight used our largest balloon size of 1500g, which was previously used on OLHZN-9. 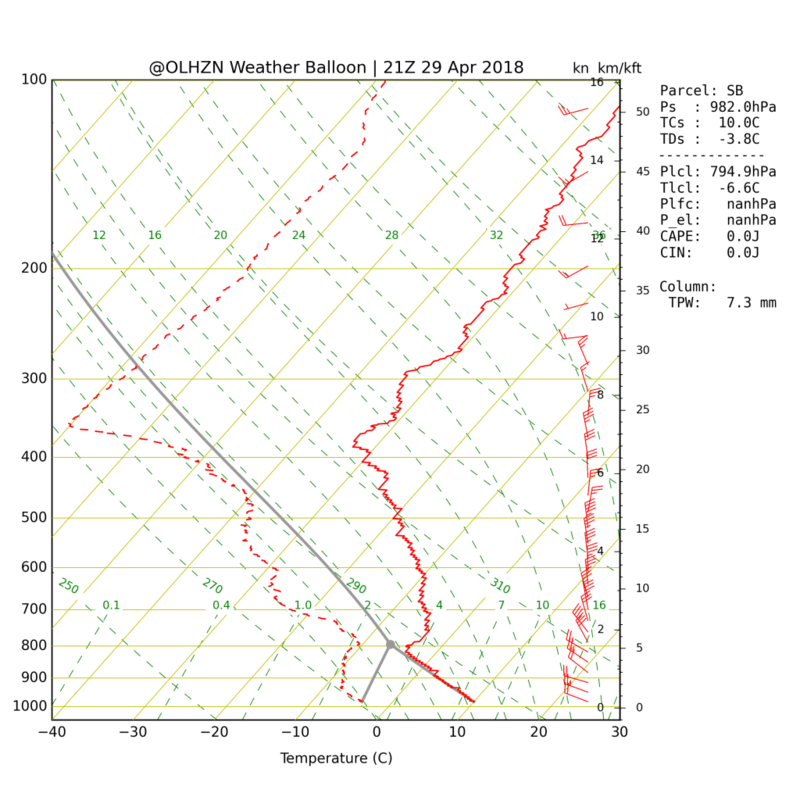 We expected a maximum altitude of over 110,000 FT., however, it appears that this balloon burst earlier than expected and only reached 105,798 FT. which is still a very respectable altitude. 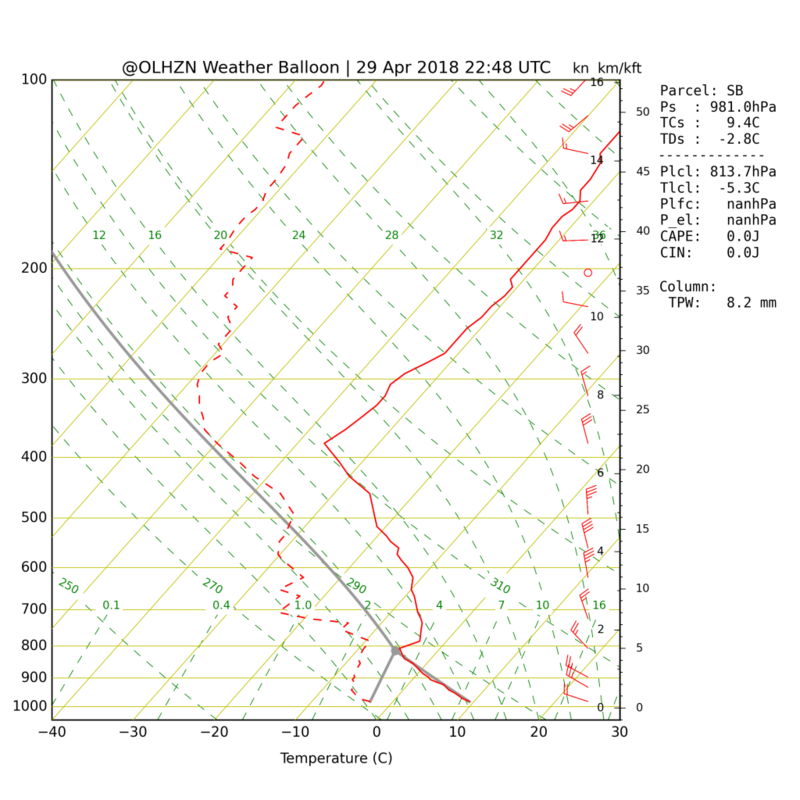 Although we did not have an upwards facing camera on this flight, the balloon remains that returned with the payload showed that the balloon ripped open instead of “bursting” open. These balloons are generally designed to burst into many tiny pieces, but this balloon remained mostly intact after burst which usually indicates a tiny defect in the balloon material that is not uncommon. This flight reached a maximum recorded altitude of 105,798 FT. (32,247 m) which is the 4th highest altitude we’ve achieved to-date. The previous higher altitudes occurred on (1) OLHZN-9, (2) OLHZN-8, and (3) OLHZN-7. 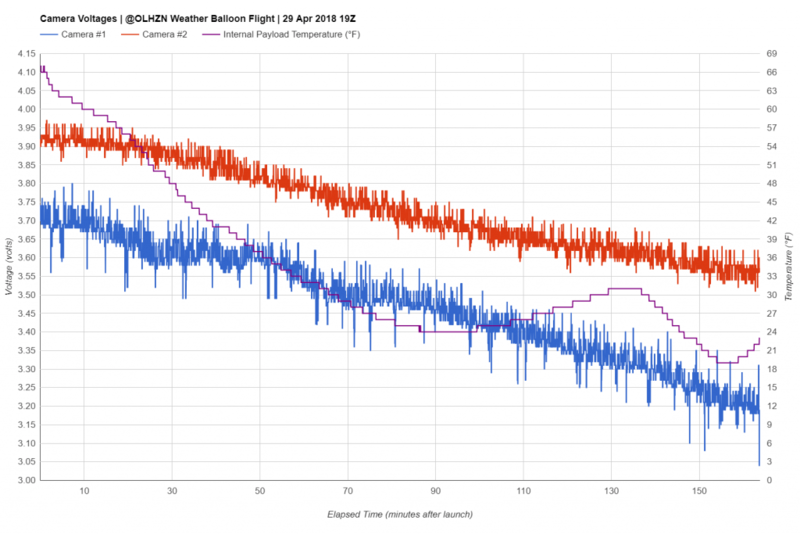 This payload reached a minimum external atmospheric temperature of -47° F which was measured around 55,000 FT. during the descent phase of the flight. This portion of the flight can contribute to decreased temperatures due to evaporative cooling that can occurred during the high descent speeds. The minimum temperature recorded during the ascent phase of the flight was -38° F which was measured around 65,000 FT. Minimum Relative Humidity: 0% ?! This flight feature two onboard external humidity sensors to measure the relative humidity percentage during the flight. 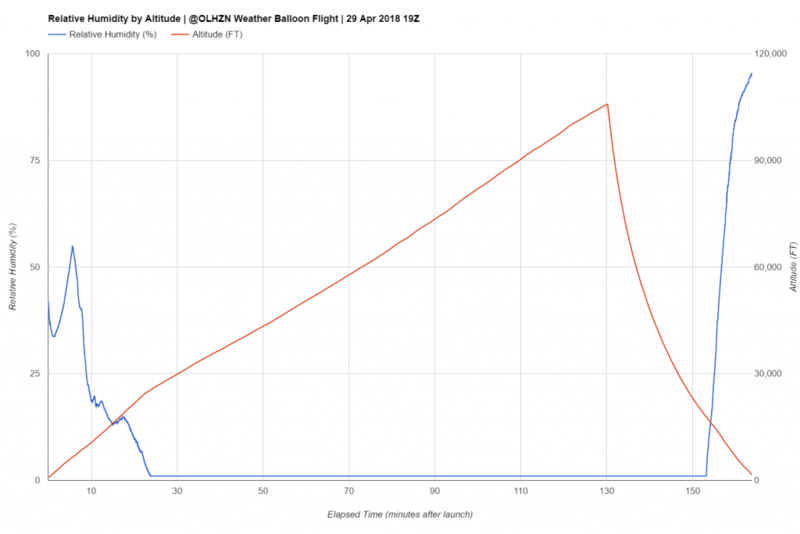 One of the sensors registered absolute 0.0% humidity above 50,000 FT. and lasting until the apex of the flight. This is extremely unusual to have absolute 0% humidity in our atmosphere. Although the sensor was likely accurate that it was very dry, the actual relative humidity was likely between 0% and 1% and too small of a measurement for the sensor to accurately read. The secondary humidity sensor reached a minimum relative humidity of 1.0% which seems more realistic. That sensor is a better calibrated sensor and likely the more realistic value. This flight will again feature two Lightdow LD4000 Cameras facing out of each side of the payload. We have made numerous changes to our main tracking system over the winter including both hardware and software changes. We’ve also added a watchdog reset timer to our software that will allow the system to intentionally reboot itself mid-flight if the system should freeze mid-flight like it did on our last flight, OLHZN-9. 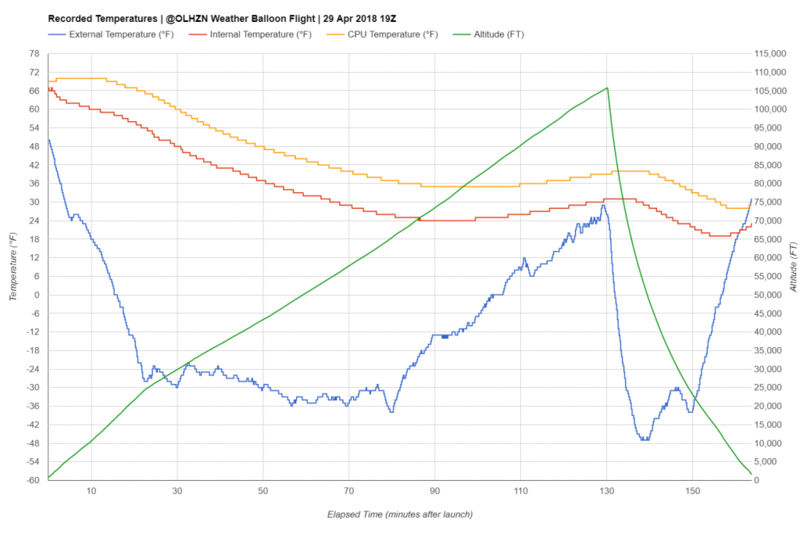 We’ve also added a humidity sensor to our main flight computer so that we can generate post-flight weather data and sounding like we did on OLHZN-10. We’ve developed a new miniature tracking system that we’ll be testing on this flight in addition to our main tracking system. This additional Arduino Pro Mini will give us additional redundancy and allow us to test a smaller platform that will eventually fly on its own. The first flight of this miniature tracking system was performed on OLHZN-10. 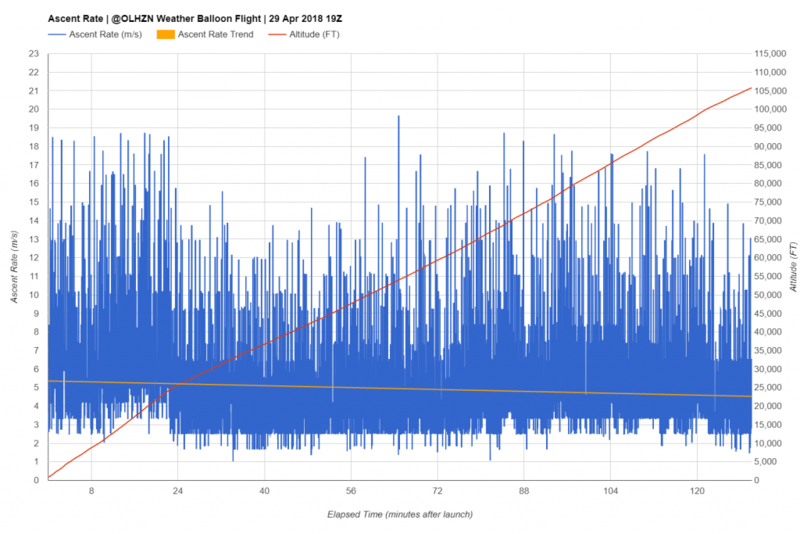 This Skew-T graph was generated from our main on-board flight computer that measures atmospheric conditions in 1 second increments. The raw data and raw sounding file for this Skew-T graph can be viewed here. 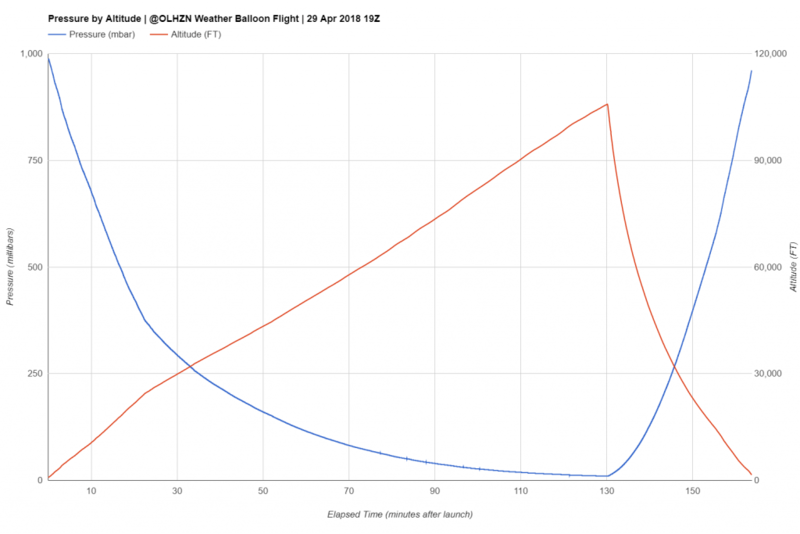 This Skew-T graph was generated from our secondary on-board micro flight computer that measures atmospheric conditions in approximately 60 second increments. The raw data and raw sounding file for this Skew-T graph can be viewed here. This temperature sensor appears to be more affected by solar radiation and reads abnormally high at the peak of its journey. 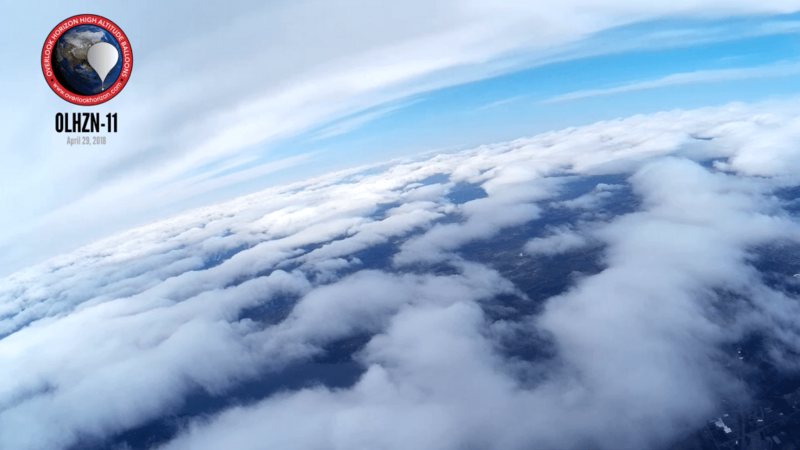 This is a 3D fly-through generated using the actual on-board data recorded during this flight. Time and positioning is all to scale. Feel free to scroll through or play with the controls to see how the flight profile looks! This map shows the actual (pink) flight path vs. the predicted (red) flight path. 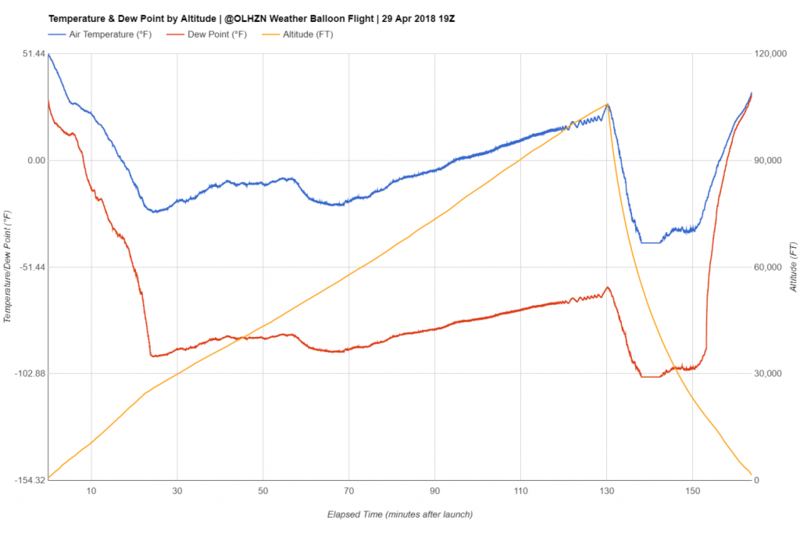 The structure for this flight followed closely to our predictions, but the first turn to the east occurred further north than expected resulting in our landing site being about 7.5 miles northeast of the predicted location which is still within the “normal” margin of error for our flight predictions.